Yes, I have switched to Windows 8 full-time, and it’s not because of the new Metro interface or charms. It’s not because of the ribbon or Internet Explorer 10. It’s really not because of anything you may expect. It’s much more simple than that. Here’s my top reasons I’m sticking with Windows 8 on my laptop. I’ve just picked up a HP Folio 13 for work and home. It’s not the most powerful machine, but it’s got an SSD built in and has an i5 processor. Out of impulse I installed Windows 7, and the machine started in ~20 seconds on Windows 7. Not all that impressive, but not slow either. On a whim, I installed Windows 8 to see if it would improve on that. I’ve been seriously impressed with the results. It starts (from POST to the login screen) in 6 seconds. Sometimes less. A seriously impressive improvement. Not only is it faster to boot, it takes seconds to log on (3 seconds compared to around 10 seconds to be ready to rock), additionally, hibernation resume is less than 3 seconds on Windows 8. Unbelievable. Not having to wait feels like the future, and this alone made me stay. When programs or Windows Update ask me to restart, and the system taking less than 10 seconds to be ready to roll again means it doesn’t bother me. Restarts used to be a pain. Now I don’t even think twice. 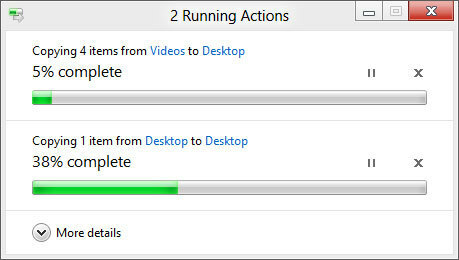 It appears that Windows 8 is more “SSD-aware” than Windows 7 and changes the way it runs when it knows it’s on an SSD. I don’t know what they did, but it’s amazing. I don’t feel like I need to say much about this, but combining these was one of the best things that Microsoft has done to Windows. I love the detailed statistics too. As someone who spends 70% of their day at a workstation with dual external screens, little things that improve my workflow can make a huge impact. I love that there are multiple taskbars… after years and years of users complaining, and I love that it’s not thanks to some shoddy 3rd-party software. I didn’t think it’d be possible to beat Windows 7’s driver database, but Microsoft has. Windows 8, out of the box, picked up all of the drivers for my Folio 13. Windows 7 picked up all but five. It’s not the obvious user improvements that are the best ones. I’ve talked a lot about how I think Metro is a bad idea, especially on the desktop, and I stand by most of that. In my usual work day, the only time I enter the start screen is to run a search for an application, or to quickly get somewhere. I don’t use the Metro applications, period. Metro isn’t something I completely hate. I see where Microsoft is going with this, but it’s nowhere near where it needs to be, and right now, it’s just a hurdle between me and where I need to be. It’s a manageable annoyance. I’ll be recommending Windows 8 for businesses based on the basic improvements (and more) that I’ve talked about here. The start screen is a pain at first at work, but eventually you find that you don’t really have to deal with it. If you’re truly happy with Windows 7, stick with it. But if you’re willing to try something new for some seriously awesome desktop-side improvements, I suggest giving Windows 8 a shot.